I just finished reading Jeremy Scahill’s book “Blackwater: The Rise of the World’s Most Powerful Mercenary Army,” which I was motivated to read after I heard Jeremy speak about his new film “Dirty Wars,” which is also the name of his latest book. Two of the most powerful passages in “Blackwater” cover lawsuits filed by the families of employees of the private military firm (later rebranded as Xe and now known as Academi) who were killed in Iraq and Afghanistan. The first passage, which runs from page 227 to 236, is about the suit filed by the families of the private contractors who were dismembered and hung from a bridge in Fallujah, leading to the 2004 military assault on that city. 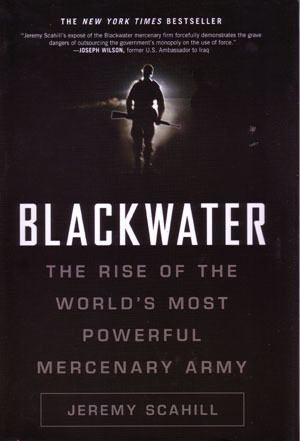 The second passage, which runs from page 237 to 252, is about a less publicized incident in which a turboprop plane operated by Blackwater’s Presidential Airways crashed in Afghanistan, killing three US soldiers and 2 Blackwater pilots. The lawsuit in this second case was filed by the families of the soldiers that Blackwater was transporting, rather than the families of the company’s pilots. Scahill writes that Blackwater asked the courts to recognize the federal Defense Base Act (DBA), government insurance that covers some contractors working in support of U.S. military operations, as the sole source of compensation for the men killed at Fallujah. The DBA capped the death benefits available to the families of the contractors at $4,123.12 a month. The attorney for the families is quoted as saying “What Blackwater was trying to do is to sweep all of their wrongful conduct into the Defense Base Act. What they’re trying to do is to say, ‘Look-we can do anything we want and not be held accountable. We can send our men out to die so that we can pad our bottom line, and if anybody comes back at us, we have insurance.’ It’s essentially insurance to kill. '” (232) The point the lawyer does not make, but that Scahill does, is that they got this insurance for free. Given that insurance costs are likely to be a major factor in the accounting ledger of a private military firm, that’s a significant chunk of government cheese. What struck me while reading the details of these cases was the resemblance of the legal arguments made by Blackwater to those made by the giants of the financial sector in the wake of the 2008 crisis. Much like Bank of America, Goldman Sachs, or JP Morgan, Blackwater socialized the risk of their ventures while privatizing the profits that came from them. The Iraq war has often been analyzed as a war waged for oil, but it’s also true that contemporary US warfare generates bonanza scale profits in and of itself, regardless of what resources it secures for multinational corporations. Firms like Blackwater and Halliburton pocket the dividends of government military contracts, while escaping the kind of legal liability that is supposed to hold corporations accountable. The use of government immunity from prosecution as a legal argument was tantamount to a kind of warfare welfare in much the same way as the logic of Too Big To Fail allowed banks to take bigger and bigger risks without having to pick up the tab, because the government bailed them out when their speculative investments led their companies to bankruptcy. Congress has yet to implement regulations that would prevent the same thing from happening again. Some of the most powerful statements I have read against the war and the motives of those who profit from them come from veterans and their family members. We would do well to listen to their voices with the same attentiveness that Schaill displayed while researching this remarkable book. 28 Jun	This entry was published on June 28, 2013 at 11:16 pm. It’s filed under Anti-Neoliberalism, Book Reviews, Economics, History, Politics, Series of posts and tagged Aaron Glantz, american empire, Bank of America, Blackwater, Book Reviews, Capitalism, David Cay Johnston, Dirty Wars, Economics, Free Lunch, Goldman Sachs, History, Imperialism, Jeremy Scahill, JP Morgan, Left media, Matt Taibbi, Neoliberalism, profit margins, The War Comes Home, Too Big To Fail, veterans. Bookmark the permalink. Follow any comments here with the RSS feed for this post. Newer: The Core is Gettin’ Soft.5: Tuba Time!